After the music has faded, the blankets have been folded and the picnic baskets have been collected and carted away, a two-man crew from Coronado Public Services begins crisscrossing Spreckels Park readying our center-city jewel for another week of summer enjoyment. 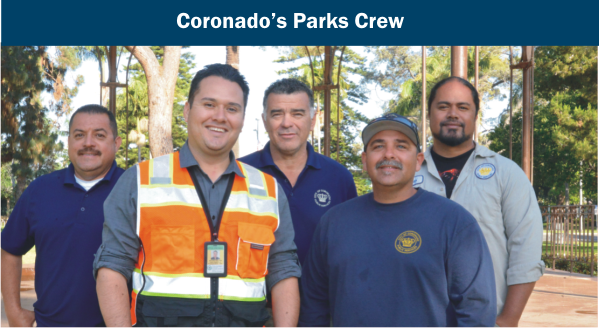 The city workers who keep Spreckels Park safe, clean and functioning for our concerts, from left: Jose Guerrero, Art Valvidia, Mondo Moreno, Gilbert Urbina and Nuuao Saole. If you see them, say thanks. Crew members collect trash and place it in temporary dumpsters along Seventh Street where it will be hauled away in as many as five truck loads. The cleanup can take hours, sometimes extending past midnight. Even with headlights guiding them the crews don’t see everything, so the next morning another crew goes out at 6:30 to survey the park again. As neighbors awaken and are sipping their morning coffee, the park is again pristine. “You would never know that some 5,000 people had been partying in the park the night before,” Valdivia said. That’s important because Spreckels Park isn’t just there to host summer concerts. It’s there for the whole community. “We want to make sure it stays nice for everyone who uses it,” Valdivia said. Several times during concerts the two-man crew will unobtrusively maneuver through the crowd emptying some of the 80 trash and recycle bins staged around the park. “We don’t want to take attention away from the people playing. Really that’s the important thing,” said Jose Guerrero, who has been overseeing cleanup of Concerts in the Park for the past 10 years. Besides trash the crew monitor restrooms to ensure they are well stocked and that port-a-potties are kept clean. The staff is also there to fix any problems. At times this can be a collective endeavor between the city and its residents. Last summer a pipe burst in the women’s restroom. Several concert goers reported the problem. One had the good sense to contact the fire department across the street and a firefighter was dispatched to turn off the water, while someone from public services drove off to find a part to fix the problem. Making sure the park remains pristine is an ongoing process that begins well before the Memorial Day kick-off concert and continues on almost a daily basis during the concert season. Just before the Flower Show a crew goes out to trim trees and spruce up the turf. Every Monday the electrical connections at the Gazebo and the irrigation system are checked and repaired if necessary. Every Thursday Public Services crews put up no parking signs along C Avenue and at least once a month they power wash the gazebo. The mornings of concerts the crew sets out chairs and tables, sections out the area between the picnickers and the dance area, open up large concrete underground boxes for concert music technicians, set the corridor around the gazebo and put up port-a-potties. All of this is disassembled at the end of the night and stored away for the next concert. Valuables are taken to the police department’s lost and found collection. “We find chairs and ice chests that people bought for the concert and just leave behind,” Valdivia said. While it is a tough, intense assignment, the public services department has never had a problem staffing the concerts. “We have people signing up for it year after year,” Valdivia said. Visit our information tent set up at each concert and inquire about making a tax-deductible contribution.